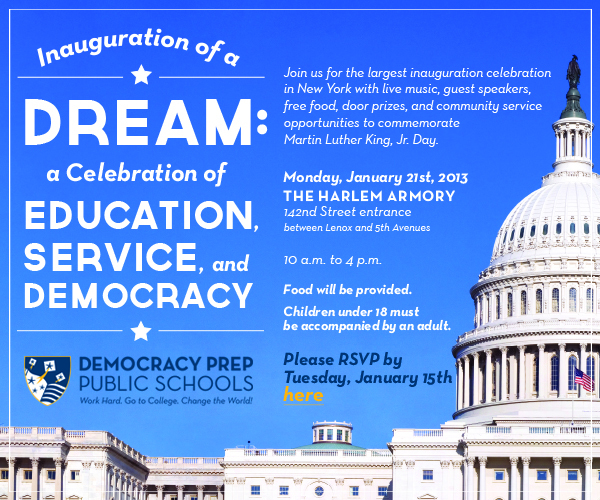 Harlem’s Democracy Prep Public Schools to host ‘Inauguration of a DREAM’ | HarlemGal Inc. This January 21st, Democracy Prep Public Schools, which operates six charter schools in the Harlem area, will be hosting “Inauguration of a DREAM: a Celebration of Education, Service, and Democracy” from 10 am to 4 pm at the Harlem Armory. This event is free and open to the public. It will feature live music, guest speakers, food, door prizes, and community service opportunities to commemorate Martin Luther King Jr. Day. This event will coincide with the second Presidential Inauguration of President Barack Obama. If interested in attending this event, please RSVP by January 15 at Eventbrite.com. Democracy Prep is a growing network of six free, open-enrollment, high-performing no excuses public charter schools committed to preparing scholars for success in the college of their choice and a life of active citizenship. Teachers and staff currently educate more than 1,500 scholars in grades K-12 at six schools across the Harlem neighborhood. To learn more about Democracy Prep Public Schools, visit their website. This entry was posted in Community, education, Events, Harlem, history, kids, politics and tagged 10026, 10027, 10029, Barack Obama, community service opportunities, Democracy Prep. Martin Luther King, education, Harlem, Jr., Kids, Martin Luther King Jr., politics, President Barack Obama, presidential inauguration, public charter schools. Bookmark the permalink.